I had previously posted pictures showing how I turned my Casita Spirit Deluxe into a twin bed model. But since those photos are buried in my blog archives, I am reposting them as a permanent web page. I removed the large dinette table and replaced the full size bed with another twin. That gave me room to add a small dinette. Click on photo to enlarge. I love the way this arrangement gives me extra space for plastic drawers under the sofa bed for canned and packaged foods. There’s also room for a bag of dog food to the right of the drawers. Our shorts, jeans and shirts are stored in baskets underneath the rear twin bed. We can take the glass top off the table, lay it on a cushions, then move the table base out of our way to give us more walk space. 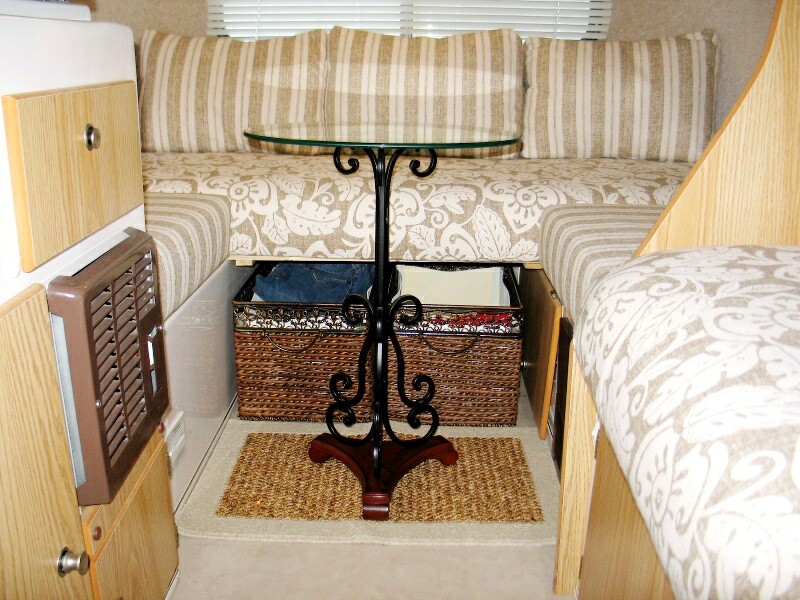 In transit, the table base goes up on the bed and the glass top goes on a dinette cushion with pillows wedged around it. The coffee shelf that Rob built for me. The only thing that bothered me about my new bed arrangement was that there was no place for me to put a coffee cup when I was propped up in bed. I couldn’t quite reach the ledge of the refrigerator across the aisle. 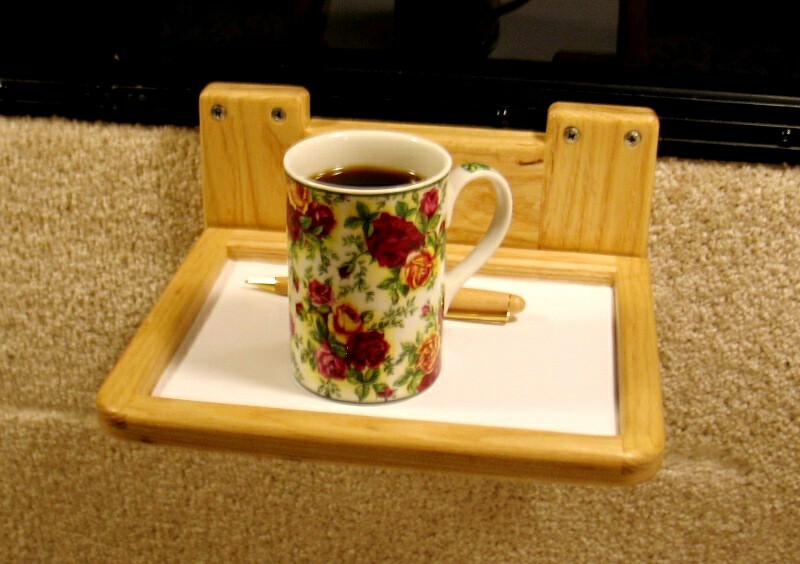 I asked a member of the Casita Forums, who is a master at working with wood, for ideas on how to build a coffee shelf. Rob stunned me by offering to design and build one for me! It is designed so the shelf slides onto a separate base and is locked on by a window latch. 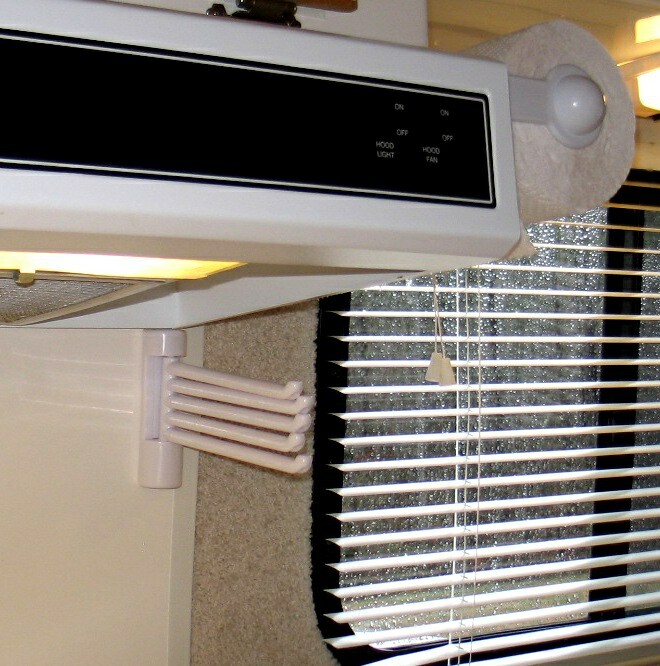 It can be removed and placed in the overhead storage compartment when it is not needed. The coffee shelf that Rob built for me that has turned into an indispensable all-purpose shelf. This is my favorite mod and I end up leaving it up almost all the time now! I used it as a flower shelf for birthday flowers when I was home last May. It also serves as a cellphone holder, tatting holder, eyeglass holder… I can’t imagine being without it now. Probably my most practical mod was adding a towel rack for dish cloths and dish towels. It has an added bonus. When a towel is hanging there, it keeps anyone outside from seeing inside through the gap between the blinds and the wall. Without a towel hanging there, you can see the head of my bed through that crack at night. Note: Due to a request from a reader about how we organize our little camper, I’m adding a link to an earlier post, How We Pack Our Casita. Towel holder accommodates 5 dish cloths and towels. Paper towel mod is to the right of the vent hood. How many can your Casita sleep? I think we are considering purchasing a camper for those summer months in Texas so we aren’t limited to fall and spring when it comes to camping here. I am strongly considering the Casita. Also love the Teardrops and the Airstream Bambi. I would love your input for a family of 4! While I am crazy about my little Casita and think it is the greatest little camper there is, I couldn’t recommend it for a family of 4. 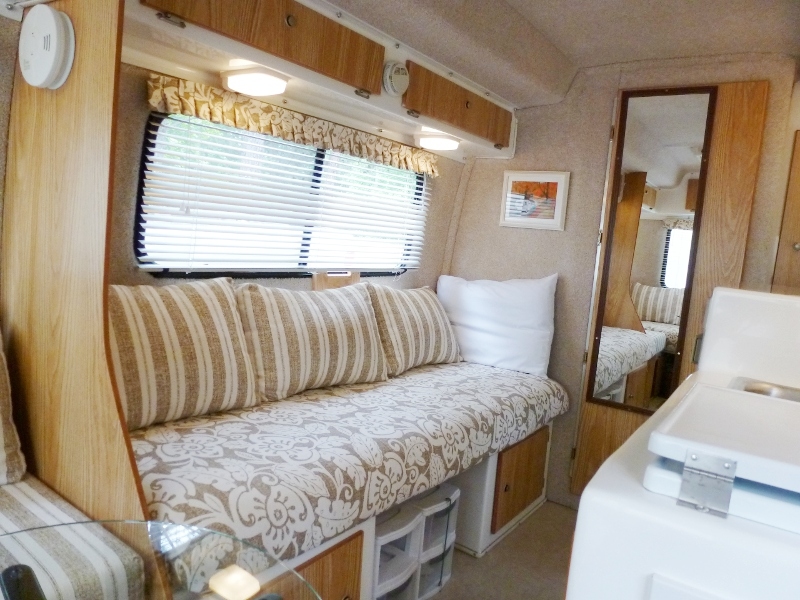 You could sleep two people in the double bed and configure the small dinette for a bed for one. But unless one slept on the floor (and got stepped on and over) I don’t see how you could get 4 in there. However, if you got the Liberty Deluxe, it can be made up into a king size bed and if you were VERY friendly, you might could sleep 4 that way. GORGEOUS…..The beds are beautiful! Did you get mattresses and have bedding made? Love the handy towel holder….!! cozygirl, I bought a queen sized 6″ Spa Sensations mattress from Walmart and cut two Casita twin size beds out of it with an electric knife. I used plywood as a base, placed the foam on it, then cut up a mattress cover to cover each bed and stapled that over the foam to the plywood. Then I found the upholstery material at a discount fabric warehouse and stapled that over the foam and mattress cover to the plywood base. It was not a complicated project at all. No problem at all. I did a blog post on it. A gentle tip for making life in a Casita pleasant is get rid of as much clutter as you can. Don’t take anything “nice to have.” Take essentials only, and try to find items that will do double duty. For instance, a pot can double as a mixing bowl. Some body washes double as shampoo. Take only one plate, one bowl, one cup, one spoon, fork, etc. for each of you. If you have company, you can use disposable plates. Anything you can do to reduce the number of items you take and still have what you need will help a lot with organization. Our Casita has enriched our life, improved our marriage, and made our retirement years so much richer and happier. I think you’ll probably discover that yours does the same for you!!! One more question if I might ask…where are your sheets and blankets stored…in one of those pillow cases? Jerry is going to look at that set up in our unit…I better there is so much more feeling of space! “Richer and happier”…I’m feeling it and can’t wait! cozygirl, if you follow the above link to How We Pack Our Casita, the first photo shows our blanket/sheet storage in the big cabinet over the bed. I went back and added that link to the article above, too. Since I have a twin bed back there, it is very easy for us to access. I have read that some people with the full size bed find that space inconvenient because they have to get up on the bed to access it. Oh perfect…Jerry is at Menards looking at materials for the closet redo right now. I’m so excited I found your re-do…it is so so beautiful! cozygirl, it feels more like a tiny condo than a trailer now. The only thing more fun than redecorating it is getting a Casita in the first place! Mary Lou, I just checked out those photos. WOW!!!! Glamping is right. That is a gorgeous makeover! Also, by keeping the liberty twins made up that way, you get a whole lot more floor space which gives the feeling of a larger trailer. Fantastic job! I would post the pictures here in the comments if I could, but I don’t know how to do it either. Thanks. Hey, as an aside, once you’ve read Eysenck you will see that these colors are ones that an extravert would pick out. Neutral is more my style but was shopping with a true extravert and got carried away. Glad I did because I really like it. Be prepared! You’ll have a good time though. We had all the salespeople involved and hopping around. It was a party. Like it! How wide are the two twins? Patricia, the rear bed is 29″ wide. It is plenty wide for my husband. The dinette bed is 27″ wide. It is a little narrow, but it could be 28″ and still allow the bathroom door to open. I just pull my bed out from the wall a little and it gives me the additional elbow room I need. We want one! Have to figure out how to actually make the purchase. We live in central Fl. Trying to figure out which model would best suit us – we will frequently be taking two young grandchildren with us. Also, we will be towing it with a Honda Pilot. Will the Pilot actually have enough power? Any advice will be very appreciated! Susan, sorry to take so long to reply. I’ve not been well. I have bad news for you. A Honda pilot does not have the capability to tow a 17′ Deluxe Casita. And I know of none of their models that will accommodate two grandchildren. You might call Casita and ask them if they still offer the standard Casita with no bathroom with the bunk bed option. The 16′ Scamp with the bunk bed option would probably be a better choice for you. But understand that the weights they advertise are dry weights before any options, such as refrigerator, air conditioner, water heater, bathroom, etc. are added, and with no propane, water or cargo on board. Really like the shelf that Rob made. I would like to do something along the same lines in our RV. Could you possible give me some more information on how it attaches to the window and how the window catch is used. Chris, my computer got wiped out by malware. I am slowly pecking out keys on a tablet. Will try to remember to answer when the new computer arrives — probably next week due to the ice storm. Chris, I’m sorry I’ve taken so long to reply. I found my post where I showed how the shelf was put together. It’s here. Do you have another picture of the coffee tray? You folks have just swept me away. 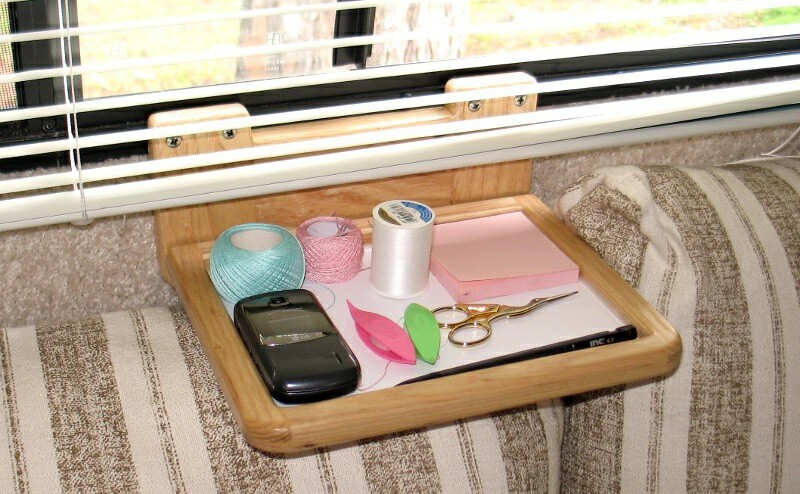 Hi tinycamper, I am constantly going back to look at your beautiful interior and getting inspiration. I am defiantly going to change my SD to the two twin following your design. I just can’t tell you how lovely yours looks………………..but then you know, you did it. ; D. May I ask you what material/type of mattress material did you use. Obviously you are a great seamstress, another mountain I must climb. Also love your mini trays make by your husband I assume. A credit to you both. Thanks for sharing. Bonnie, I bought a 6″ Spa Sensations memory foam mattress from Walmart and cut it to size with an electric knife. The fabric is an upholstery fabric that I found at a discount fabric warehouse. The cushions for the new dinette seats are sewn. However, the beds simply have a mattress pad over the foam, stapled to a plywood base. Then the upholstery fabric is stapled over that. It is really easy! thank you, I think I might be able to handle that. You really did a lovely job. How did you like that mattress from Wal mart? Did you get 2 twins? A twin size would not be quite long enough for the rear bed which is why I got the queen to start with. Or you could buy a twin for it, cut an extra piece of foam and use spray adhesive to glue the end on. That is what the Foam Factory recommends. I had bought foam from the Foam Factory online before. It’s excellent quality and great prices, but the medium foam is far too hard. It feels like sleeping on a brick. I used that when I had my Aliner and had to buy a softer foam for a topper. So I do recommend the Walmart Spa Sensations 6″ mattress. I have read that the 8″ is too hard. Great……………..sounds just what we need. Thanks. Love your shelf! We do a simpler version of that. I put a good-sized wooden cutting board on the sofa between us when we are drinking coffee or tea. Do you use the tatting shuttles much? I’ve always wanted to learn to do that. The product is so delicate! I go with the tatting in spurts. I had a very hard time getting the hang of the shuttles, so started with needle tatting. If you are interested, check out Youtube for how to videos. I finally learned to use the shuttle when I ordered a book with a DVD that took you through it in slow motion step by step. When I finally understood what the thread needed to do, it just fell into place. My main use for tatting now is for decorating hand made greeting cards. I buy little bows and such to add to it, and it makes it so special. How very personal with the lace! Sweet. Hi, tinycamper: we’ve been eyeing your twin bed mod for a year or so and are now thinking more seriously about it. Now that you’ve lived with it for awhile, would you do it the same way again? We were a bit cautious about losing a dinette table, but we think we’ve designed one that will fit the area (with leaves to fold down to access the rear bed.) So, did you use a full length piece of plywood for the side bed or just fit a piece on the ledges of the bench seats? And did you reuse the side dinette seat and back cushions for the rear seating cushions…just sew new covers? Have you had any shifting of the plywood when traveling? We’re going to start collecting the materials for the mod soon…yay! a trip to both the hardware AND fabric stores! Yes, I would do it the same way again simply because we must have twin beds. We go to bed and get up at different times, read and do crosswords in bed, and are up several times in the night so a double bed would be torture. I do seriously miss the dinette and wish there were a way to have a bed and a dinette there. But I really hate having to make the dinette into a bed whenever I want to take a nap or when I’m tired at night. And the 6″ mattress is way to thick for the dinette cushions. So, for us, the permanent dinette bed was the right choice. I used a full length of plywood for the bed because it was so much easier to make than sewing a fitted cover. All I did was put the mattress on the board, put a mattress cover over it as padding and stapled it to the plywood. Then stapled the upholstery fabric over that. You can reuse the dinette cushions in the new dinette area in the rear. They will fit perfectly if you make the rear mattress 29″ wide. I used different foam, but the new foam is harder and thicker than I like. So if I were doing it again, I would reuse the dinette cushions back there. I did put a carpet runner under the dinette bed to keep it from sliding and scratching the fiberglass. One thing to remember is that the dinette bed is very narrow. If you pull it out from the wall a little at night, it gives you an extra couple of inches of much needed elbow room. I would love to have the “how to” design for the coffee table that is attached to the window. Would you be willing to share? Dolly, I would be happy to share if I had the pattern, but Rob made it and mailed it to me, so I have no idea how he did it. I think he may have put how he did it on the Casita Forums in response to someone’s question, but I don’t know what search terms to use to find it. I do remember Rob saying that getting the angle to attach the shelf was tricky because the Casita wall has a slight inward slant at that point, so it’s not a straight 90 degree angle.